Now there is not just?one correct way to set-up an author booth.? However,? ?since it was my first experience doing one of these school author nights, I made some observations?to?help?other newbies like myself.? The set-up is basically?that you are?in a school auditorium with tables (booths)?placed?in a circle.? Each author has his/her own booth and everyone is trying to promote and sell their story, with their own twist or gimmick to help capture the students’ attention.? There was a wide plethora of books being sold; non-fiction, historical non-fiction, workbooks for school teachers,? children’s fiction,?YA, etc.? There are also authors who have been doing this for many years so have already tested the waters of what works and what doesn’t work.? They also had various opportunities to try out?different design and set-up ideas for their particular booths. At one point I looked at my booth, which I thought looked nice and professional, and started comparing myself to some of the other booths around me, such as the booth with the huge big screen projector!? I thought I was not prepared for this but then went over to speak with the author.? He?was using the?big screen to hold a history trivia game.? This tactic enticed students to come over to his booth, where he was selling a historical non-fiction book (something students?may pass by in a hurry) and enticed the?students to interact with history and see how much fun it could be.? What a great idea, but don’t run out and buy an expensive projector just yet! ?This is not required for everyone’s booth, or even the best method to promote certain novels.? But it worked for him. Other authors I noticed had a lot of DIY ideas, such as designing big science fair type posterboards to introduce the students to their books, characters, etc. ?An author?targeting young children with a story about a dolphin? had a stuffed animal of a dolphin on?her table.? I watched as children were drawn to the stuffed animal and that gave the author an opportunity to talk about the time she swam with dolphins and therefore wrote a story about her experience.? You start figuring out your pitch with trial and error.? I started telling the students that my book was like Harry Potter meets The Hunger Games.? If the students liked one of those novels, or both, they usually stuck around to hear the synopsis of my novel. It could be a little overwhelming at first, especially when the students come running in.? But when you get a chance walk around, talk to some of the authors and find out about their books.? Look at their set-up and see how they are incorporating the theme of their novel into their Author Booth.?? The idea is Be Creative and you don’t have to spend a fortune promoting your book.? 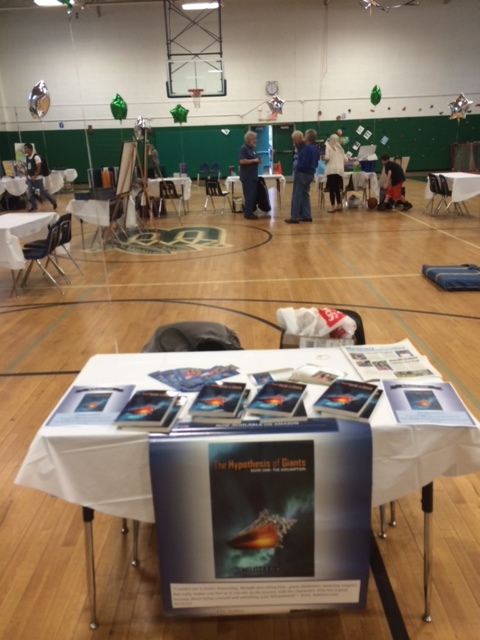 Even with my booth, without all?the glitz and the glam, I had my novel stationed upright front and center.? The book cover alone helped draw students to my booth, wondering why there was a conch shell on the cover and wanting to find out more about the story.? Giving out free bookmarks was a great way to bring people over.? I saw some authors handing out?other free merchandise (such as pencils, erasers) ?but the bookmarks worked as a great free giveaway since they were so inexpensive to make. If you are attending a local author event, I recommend bringing copies of?local media articles with you.? I had brought?an article featuring me in the Hicksville Illustrated and one of the parents had?attended Hicksville High School.? That was a great conversation starter.? She ended up buying the book for her daughter. The first time, like anything, is always the most difficult because you don’t know what to expect.? But hopefully this helps prepare you for these type of author events so that you won’t be caught off guard.? Sales will vary per event, but the main thing is for you to figure out what is the best way to promote YOUR novel and you as an author. Most importantly have FUN and don’t forget to?SMILE!? 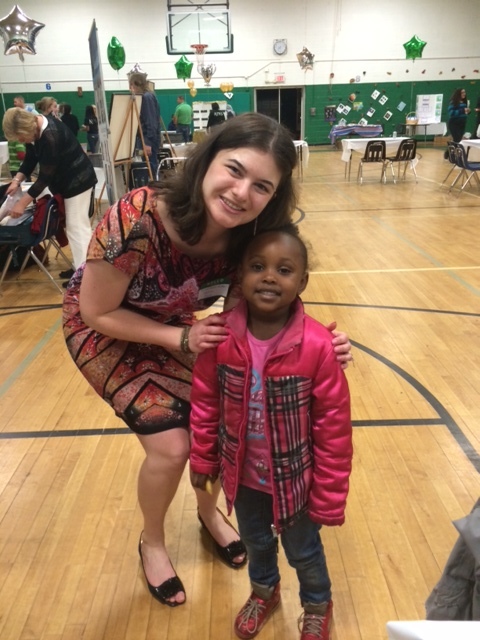 ?Remember the best part is interacting with the students as well as meeting fellow authors.?? We can learn from each other and help promote literacy together!